British archaeologist Howard Carter and his workmen discover a step leading to the tomb of King Tutankhamen in the Valley of the Kings in Egypt. 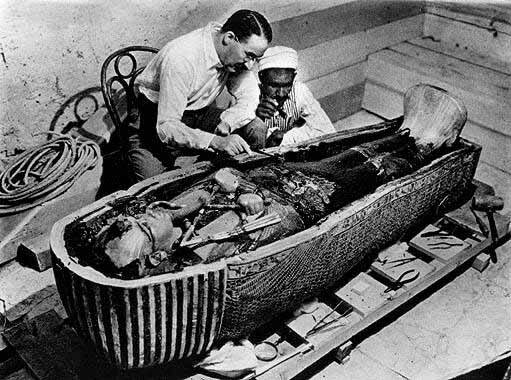 When Carter first arrived in Egypt in 1891, most of the ancient Egyptian tombs had been discovered, though the little-known King Tutankhamen, who had died when he was 18, was still unaccounted for. After World War I, Carter began an intensive search for “King Tut’s Tomb,” finally finding steps to the burial room hidden in the debris near the entrance of the nearby tomb of King Ramses VI in the Valley of the Kings. On November 26, 1922, Carter and fellow archaeologist Lord Carnarvon entered the interior chambers of the tomb, finding them miraculously intact. Thus began a monumental excavation process in which Carter carefully explored the four-room tomb over several years, uncovering an incredible collection of several thousand objects. The most splendid architectural find was a stone sarcophagus containing three coffins nested within each other. Inside the final coffin, which was made out of solid gold, was the mummy of the boy-king Tutankhamen, preserved for more than 3,000 years. Most of these treasures are now housed in the Cairo Museum. 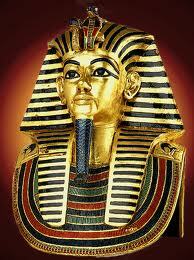 Learn more about Tutankhamun by clicking on the photo of his mask above. Site contents copyright © 2019 Recorder Online	except as noted. All rights reserved. | 86 queries in 2.587 seconds.